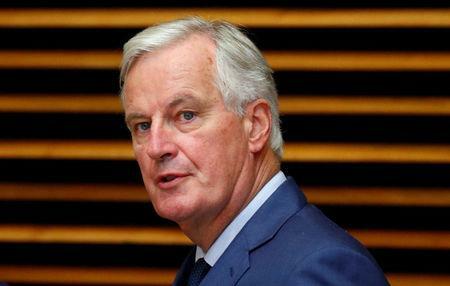 PARIS (Reuters) - The EU's chief Brexit negotiator Michel Barnier stood firm on the need for checks on goods shipped from mainland Britain to Northern Ireland after Brexit, while insisting this would not amount to a new border, in an interview published on Sunday. Negotiations on Britain's departure from the European Union are stalled on several issues, but primarily an Irish 'backstop' both sides agree is needed to avoid a hard border between the UK province of Northern Ireland and the Irish Republic, an EU state. Brussels insists that this in turn requires controls on goods shipped from mainland Britain to Northern Ireland, and is trying to overcome objections from among UK Prime Minister Theresa May's Conservatives and the Northern Ireland Unionists crucial to her government's parliamentary majority. "Contrary to what some are saying, this is not a border we are creating in the Irish Sea to undermine the integrity of the United Kingdom," Barnier told Le Journal du Dimanche. Veterinary checks are already conducted on 10 percent of livestock transported to Northern Ireland from the rest of the UK, Barnier said. This would increase to 100 percent under the backstop, he added, but a later animal-health agreement could reduce the proportion inspected to 40 percent. Barnier said other backstop measures were needed to prevent unauthorized Irish imports of goods such as chlorinated chicken, produced in the U.S. but outlawed by EU food standards. He said other issues still preventing a deal include the demand by Brussels that the European Court of Justice should have jurisdiction over its implementation - as well as Britain's reluctance to address registered designations of origin for foodstuffs, such as champagne or Roquefort cheese.